It’s pickling season and this year I’ve discovered a variety of cucumber that makes the best dill pickles I’ve ever tasted. I grow some cucumbers in my garden and buy the rest from Libby at the local farmer’s market. Most cucumber plants are garden devas— demanding constant attention. One afternoon they preen with lush big leaves, a multitude of yellow blossoms, and verdant green baby cucumbers; yet for all that glory, by the very next morning the foliage can look wretched—covered with unsightly powdery mildew or blotches of scab. Organic treatment options are short lived and require frequent application. This year one of the farmers at the Wednesday market introduced me to “harmonie” cucumbers—intrepid growers that deliver without all the ups and downs. The dark green skin is tender and not too thick, the inner pulp flavorful, not bitter, the seeds are small and the plants are healthy and beautiful day in and out, thriving on drip irrigation, lots of sunshine and fertile soil. I enjoy making my own pickles—it’s something I took up after being inspired by Aunt Rose’s pickles. In the beginning I used the ubiquitous hot water bath, vinegar based method, the same process my aunt used. 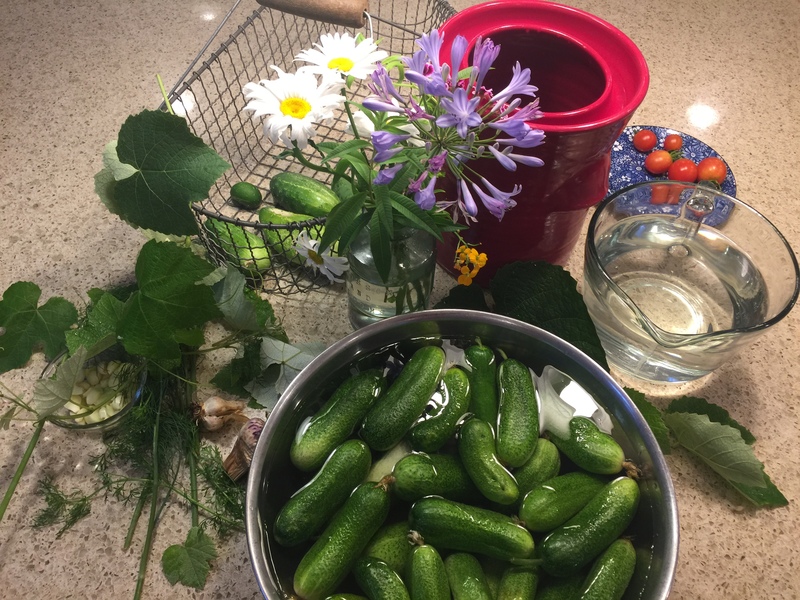 About five years ago I began using the ancient brine fermentation process which relies on beneficial yeast and bacteria to preserve cucumbers by transforming them into pickles. It’s a simple technique; plus there’s no boiling a huge pot of hot water on a hot summer day. The night before I plan to pickle, I heat half a gallon of filtered water into which I dissolve 3 Tablespoons of salt; I let it cool overnight. The next day I gather cucumbers, lots of dill, garlic, peppercorns and a few grape leaves. Once everything is assembled, I carefully pack a big pickling crock with all the loose ingredients, and then pour the brine solution over everything. The mixture needs to stay submerged beneath the surface of the brine—it’s an anaerobic fermentation process — so I weight it down with a ceramic stone, and place a cover over the crock. The fermentation process will take a week or two. As the cukes soak, mold, scum (also known as bloom) and weird looking bubbles form on top of the brine. This stuff is kinda scary looking; but it’s different from the fuzzy growth on top of leftovers at the back of the refrigerator; it won’t hurt you. Kitchen germ-o-phobes and refrigeration police would probably freak out at this point if they observed the brew, but humans have been preserving vegetables this way for thousands of years. Every day or so I skim off the bloom. After about 5-7 days soaking in the brine, the pickles are ready to taste. The first time I did this I half thought I might die, but I risked it anyway. I took a teeny bite, informed my husband so he’d know what to tell the paramedics if necessary, and waited to see if I survived until the next morning. I woke up feeling great—eager to take another taste of the pickles in process. I sliced a chunk off one of the cucumbers; it was almost ready, just needed another day or two. Once the pickles reached the ideal flavorful and still crunchy state, I packed them into wide-mouth quart Mason jars and refrigerated them. The nutritional health benefits of these pickles is mainly in the probiotics, a term meaning “for life”. These microorganisms form during the long soak in the brine. Probiotics have very beneficial properties for the intestinal flora. Even before science told us anything about probiotics, our distant forebears knew that eating a little sauerkraut, chutney, or a few pickle slices with a meal helped to keep the gut happy. A few Saturdays ago, as I was packing up a late summer pickle batch, rioting was taking place in Charlottesville, Virginia. The KKK, neo-Nazis and alt-right neo-fascists—many of them carrying assault weapons and dressed in riot gear— were marching to protest the planned removal of a statue of General Robert E. Lee. Human rights counter-demonstrators had gathered as well—mostly groups and individuals practicing nonviolence but they were joined by antifa , an armed group ready to physically defend themselves and others from the violence of white supremacists. The situation was volatile and became deadly. I was getting “breaking news alerts” on my i-phone every few minutes. The intimidating vitriol and brazen incitement to violence had begun Friday night when white supremacists led a torch-lit march through the streets. By Saturday morning the scene was dry tinder. Like many, I was profoundly shaken. I had mistakenly assumed that our country’s old wounds were more healed than they are. I wonder if we will ever arrive at a time when we will live together amicably in an environment of dynamic harmony among all the different voices? Sometimes the discrepancy between what I hope for and what I hear on the news feels like it’s starting to pickle my brain! But seriously, sometimes it helps to clarify a situation by noticing the partial similarities between two different processes. So, viewing our current socio-political situation via the analogy of fermentation and probiotics, what can we discern? Are there any correspondences between the fermenting process and the social unrest thats been brewing in our country for a very long time? Just as mold and scum inevitably form on top of the brine during the early stages of transforming raw vegetables into fermented food, so to do unsavory human elements break forth during times of change and disruption of historical norms. Unfortunately, as we are seeing now, things often get dangerous before they (hopefully) improve. What we previously assumed was unshakable progress in our political/social/community environments is now threatened. The effect of changing times upon those who feel left behind creates a backlash of resentment, seething anger, and a longing to return to sugar-coated versions of an idealized past greatness. Yet most of us realize that it’s impossible to wrench things backwards; change resides in the conditions of the “here and now”. However it’s essential that we appreciate the difference between nostalgia and benefitting from the lessons of history—cautionary tales that can help us avoid repeating similar tragic mistakes in the present day. During the Civil War General Lee authorized and personally committed despicable violence, torture and other hateful actions towards African Americans. Lee and most other confederates were unable to recognize that skin color is unrelated to human value, that all people are worthy of justice and compassion, and that torture, lynching and splitting families apart are depraved actions which only intensify the problems. After defeat of the Confederacy, after Jim Crow, after government mandated integration, after a black man was elected president of the United States— these attitudes festered in the psyches of many angry, fearful people who felt deprived of their glory days as top dogs. This is the legacy that the statues of General Lee venerate. From another vantage point, the leaders of the Confederacy provided valuable lessons about what doesn’t work. Mistakes are an invaluable part of human advancement. Edison had many failures before he invented the incandescent light bulb. We don’t need to build monuments to mistakes; but to create a better future we must learn from them. Perhaps those empty pedestals where statues of confederate heroes once stood could portray newly sculpted figures showing humanity’s hard won progress along with humanity’s ongoing ability to birth inspiring solutions. Wouldn’t it be great if our public places were decorated with images of people coming together to work towards a future that holds pervasive social justice, equal opportunity and satisfying lives for all? So, getting back to our analogy between fermentation and the current social/political unrest: what life-affirming benefits may be aborning within the roiling of disagreements, threats, and violence? Just as probiotics are formed in the alchemy beneath the scum of my vegetable ferment, I take comfort that this top layer that exposed to the air is also called “bloom”—the precursor to fruiting. From this perspective it is entirely possible that those who are now fermenting in in anger and vitriol are equally subject to the process of transformation. It’s within the realms of possibility that love and compassion will bubble into a state of bloom for many of those who went into the process only wanting disruption. Once things have pickled long enough, we may begin to see more formerly disaffected people participating in compassionate, loving and wise grassroots action and public policy. Compassion is not the same thing as pity; it’s putting ourselves in another’s shoes and beginning to feel what that must be like. Love isn’t romantic or sentimental; rather it’s seeing and knowing with the intelligence of a caring, wise heart. Only when we’ve stewed around in the ferment long enough to realize that hating and killing doesn’t bring about anything except more wounding, reciprocal violence and fear do we realize that what we really want is harmony instead of dissonance, cooperation rather than provocation. Clearly, the process we are in is frightening but there is also cause for hope. While I can’t possibly connect all the dots, nonetheless I have faith that what is currently brewing in this alchemical mix of raw betrayal, trauma, confusion, and demagoguery is the possibility of a “blooming” future of significant healing transformation and a time when people in our land can live together in more cooperative ways. Granted it would be a help if the top leadership had some sort of moral compass instead of just looking for the ego gratification of making deals, any deals. Without a doubt, we are in something of a pickle. Fermenting raw ingredients is a messy, uncertain process. In the meantime, we can individually aspire to contribute compassion, wisdom, and loving kindness into the world around us. We can draw down deeper than our tendency to rant or blame or retreat and choose to be a calm presence in the midst of everything. Individually and collectively an evolution of consciousness is in the works. The healing factors for digesting and transmuting past evil and hate are beginning to exert some influence, even if we can’t see it yet. How long will it take? There’s no timetable, and not everyone will choose to grow and heal; but many will undergo positive changes. Transformation is absolutely possible. I recall the story of John Newton, self proclaimed wretch, who felt the healing power of grace carry him into a new beginning. He turned away from his life as captain of a slave trading ship and chose instead to be an abolitionist, helping to bring about the end of the slave trade in England. Deep within the briny slosh of confusion and suffering of our present time beneficial strands of transmutation we can’t taste, see or feel are alive. At some point in the not so distant future we will step into better ways of living cooperatively with each other. But for now, underneath the slime, we are pickling harmony.